The snow that came in this past weekend was really heavy and sticky. But since it was very windy, it didn't uniformly stick on things. Such as in this picture, where only the north side of the columns, light posts, and gazebo in the Bloch Cancer Survivors Park are coated with snow. It created an interesting contrast. It had the look of a shadow but wasn't. By the way, this park used to be the Old S Curve, before Lake Shore Drive was straightened out in the mid-80s. freak Winter resurrection, these daffodils are survivors. I can't find any information about this mural on Fairbanks Court. It is captioned "Michelangelo Buonarroti, Moses 1515"
The building houses the Pritzker Military Library. Who did it? Why is it on this building? ... stay off the sidewalk. 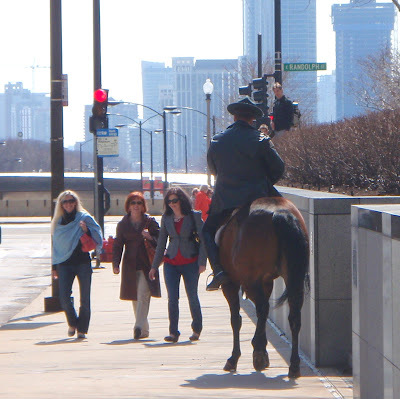 I missed the shot where the horse was blocking the whole sidewalk. down the street don't seem to notice the horse. 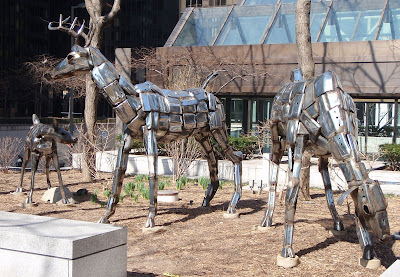 This deer family can be found by the Aon Center (also known as the Amoco Building and, before that, Standard Oil Building) in the Loop neighborhood. They are made of car bumpers by an artist named John Kearney. There are several of his bumper animals scattered throughout Chicago (perhaps I'll do a tour of them one of these days). Heading west on Division Street in the West Town neighborhood. 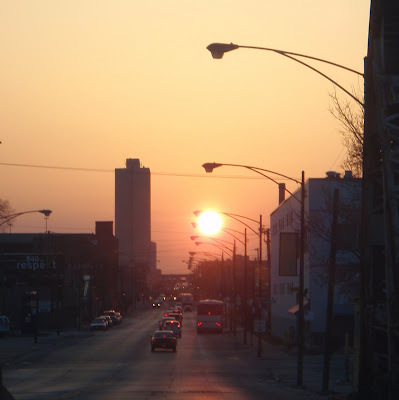 I liked the way the sunset took over the sky and the street with shades of color ranging from apricot to red-orange. North Park Village Nature Center, a hidden jewel in the North Park neighborhood of Chicago, held their annual Maple Syrup Festival this past weekend. Along with music and food, there are demonstrations on how to tap trees and make maple syrup. 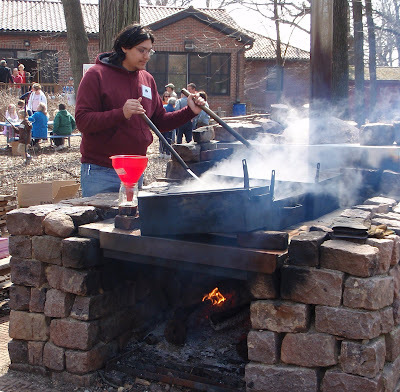 Here, one of the Nature Center representatives is cooking the sap, reducing and concentrating it to become the sweet syrup that we put on pancakes and use in baking. It takes about 40 gallons of sap to make 1 gallon of maple syrup. Little bursts of Spring from the Gary Comer Youth Center's Rooftop Garden. In addition to these beautiful irises and crocuses, they have kept oregano, thyme, spinach, lettuce, and mache growing over winter in row covers (which are plastic tents that cover the crop beds, collecting the heat from even the cold wintertime sun). The flowers, fruit, vegetables, and greens get used in the Center's after-school program, are distributed to neighborhood residents and also go to lucky restaurants. If it has these lovely plants growing now, I can't wait to see what it will be like in the Summer! Today we're back down to the Chicago Riverwalk. The passage under Lake Shore Drive has 28 large painted tile murals by artist Ellen Lanyon. They present the history and significant events of Chicago. This one focuses on the Museum Campus and Buckingham Fountain. There are postcard-like illustrations of the Field Museum, Shedd Aquarium, and Adler Planetarium, which make up the Museum Campus. There is also a short description of the 1909 Burnham Plan, which preserved the lake front for parks, monuments, and museums. If you look very closely, it also has a subtle outline of the original lake front shoreline in the background. This is my 100th Daily Chicago Photo post! Thank you to everyone who looks at these posts and thanks for all the great comments that make me feel so artistic! 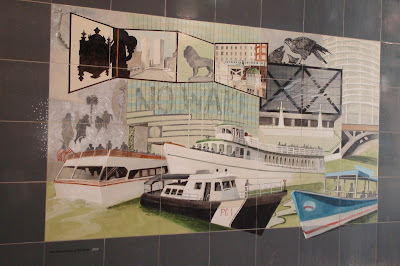 Along the Chicago Riverwalk, below Lake Shore Drive is a tunnel with 28 large painted tile murals by artist Ellen Lanyon that present the history and significant events of Chicago. Each mural is a composite of mini-scenes that are part of Chicago's history. There are so many different references in each that you're bound to notice something new each time you look at a mural. This one, for example, has the Marshall Field Clock in silhouette, the Art Institute Lions, the River boat traffic, part of the base of the "it-will-always-be-called" Sears Tower, and some peregrine falcons. What I only recently noticed was the mini-blizzard scene in the middle left section. 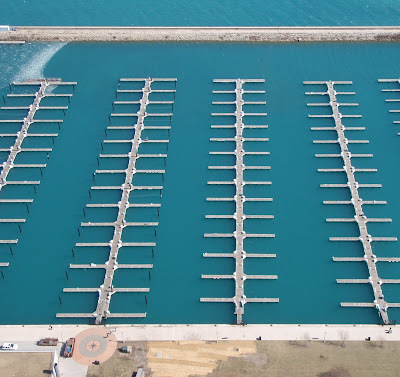 that are near the Coast Guard station by DuSable Harbor. 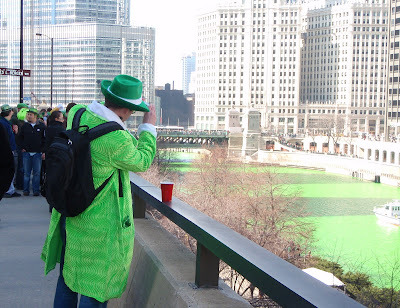 It's not just the Chicago River that turns green to celebrate St. Patrick's Day. I had a completely different photo ready to post today. But when I saw today's sunrise -- well that other picture can wait. 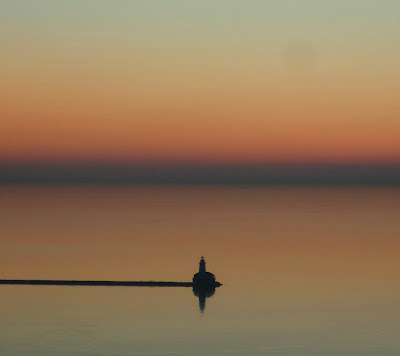 The way the light was hitting Lake Michigan obscured the ice, making it look like the lake was dead calm (something that does happen periodically in the summer) and letting the Chicago Harbor Light cast a reflection in the ice. 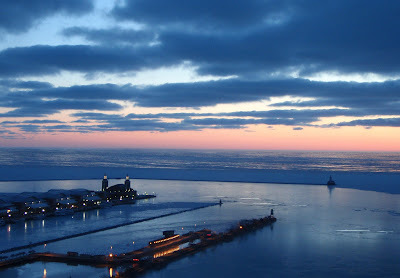 OK, so last week it was warm enough that I went running along the lakefront and the ice in the harbor melted. 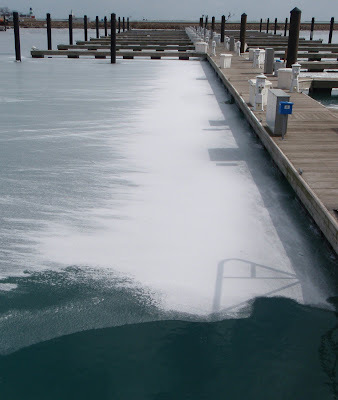 But then it got cold so a thin layer of ice formed. A little lake effect snow added a dusting over the ice. It should melt again with the forecasted weekend warm-up. Back in February, I posted a photo of the quote shown in the picture below. I thought that it was a form of public art. 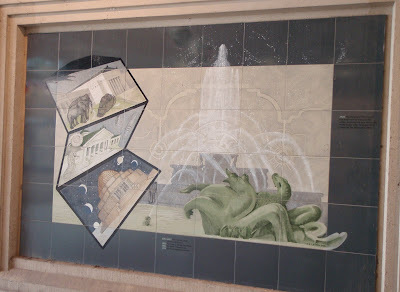 When I did some web research, I found out that it was the Metra Station entrance, itself, that was actually the art. 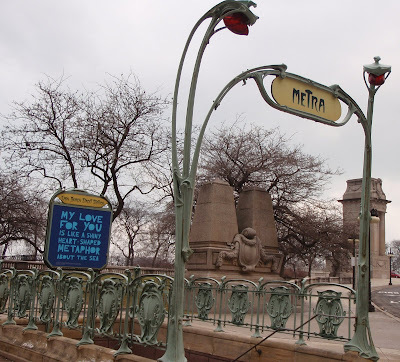 It is a replica of a Parisian rail station designed by Hector Guimard. Wacker Tower, which is also known as The Chicago Motor Club, is a stately Art Deco style building on Wacker Place. 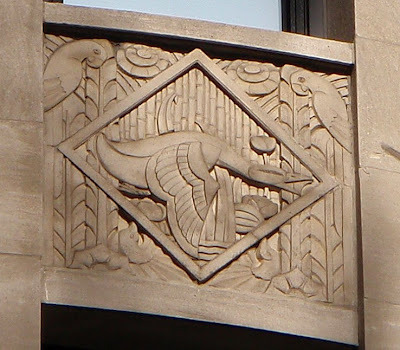 Here is one of the panel reliefs on the building. The light wasn't good enough (and it was too cold and windy to be gloveless) to get pictures of the other panels and the beautiful entrance. I'll go back when we get some more sunshine at the right angle (and it warms up again). Plans to convert it to condos have been delayed so it is currently vacant, prompting Preservation Chicago to include it on this year's list of most endangered buildings. Awhile ago I posted a photo of a statue called The Bowman. This is the companion piece, The Spearman. 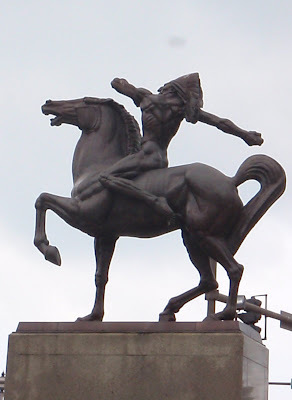 Both are bronze and created by a sculptor named Ivan Mestrovic. As with Bowman, the Spearman's spear is intentionally missing allowing the viewers complete the piece with their imaginations. After a couple days of the upside of Spring (warm temperatures, blue skies and sunshine), we got two days of the downside of Spring (rain, fog, more rain, lots of rain, thunderstorms, more building-enshrouding fog). I know you need both to get the real flowers to emerge from their winter hibernation. 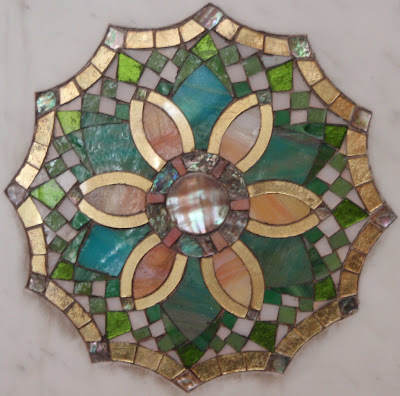 But, the best I can do for now is this mosaic flower from the stairwell in the Chicago Cultural Center. 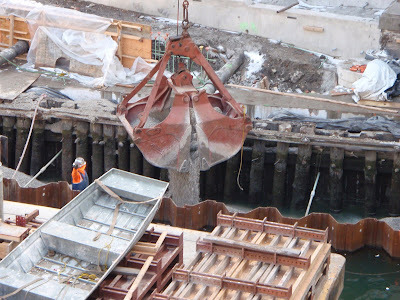 They're not building a mystery -- they're building a river walk. Or, rather extending the river walk. You could walk/run/bike along the river from the lakefront to Michigan Avenue but then you had to climb stairs, cross Michigan, and descend stairs to continue (and then do that again at Wabash). Now they are working on creating "under-bridges" with the long-term goal to have the river walk run to State Street. To do this, they have to create a walkway. 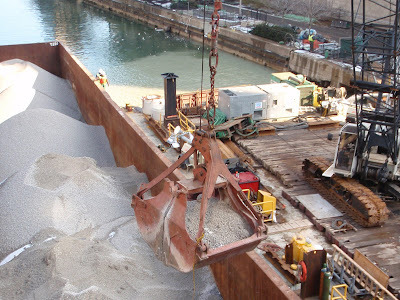 Here, they are filling in the planned path with gravel shipped in on a large barge. 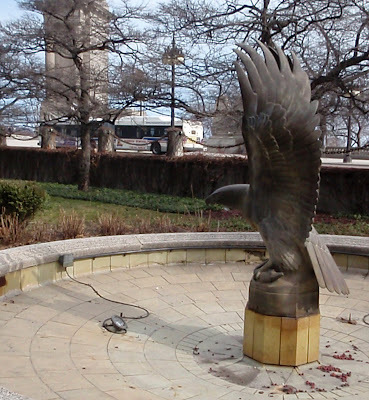 I liked the shadow that was created by this eagle statue, by Frederick Cleveland Hibbard, in Grant Park. It looked like one of those cartoon scary monster shadows. I'll have to come back in the summer to take a picture of this statue when it is actually a fountain. A side note: My sunrise picture from March 3 is on the NBC Channel 5 site in their weather slideshow "Proof That Spring is on its Way". Mine's the one with Navy Pier in it. A couple of days ago I posted a photo of a city work crew filling potholes. The potholes they filled are holding up but they didn't seem to get to this obstacle course yet. This is on Wacker just after you exit from Lake Shore Drive. Cars have to swerve a little to straddle the caverns. It's a different kind of sign of Spring. Follow-up Note: I saw city crews fixing these holes on Saturday morning. 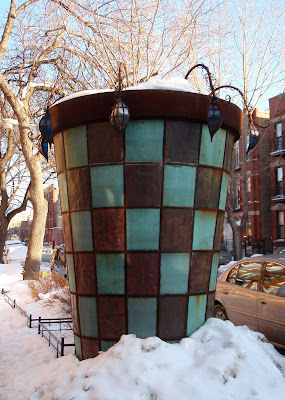 I'll be interested to see what grows in THIS flower pot, which is located in the Noble Square area of Chicago's West Town neighborhood. 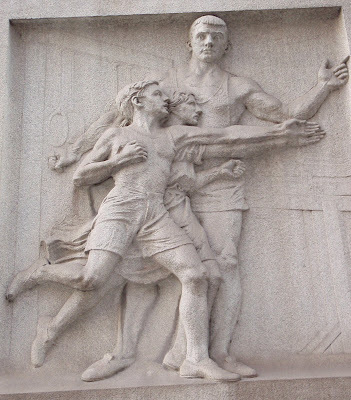 This is the last of the four relief carvings on City Hall. The carvings "represent ... four principle concerns of city government: playgrounds, Schools, Parks, and Water Supply". This one is the Playground one. Like the other three, this one has great detail. Faintly carved in the background are the flexibility rings, and either a pommel horse or the horizontal bars (on which I am a total klutz). History Note: Today is Chicago's Birthday. It was incorporated as a city on March 4, 1837. The lake is still ice-covered. The temperatures are still in the 20s/30s. the temperatures are supposed to be in the 50s later in the week. Hopefully, Spring is starting to win out over Winter. 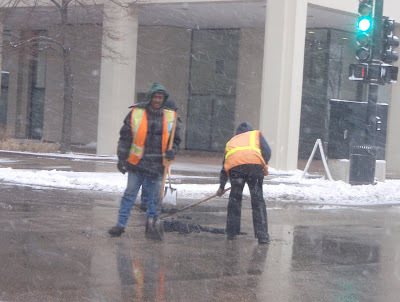 Trying to get ahead of the growing pothole problem, these city workers were out on Wacker Drive filling some small craters. 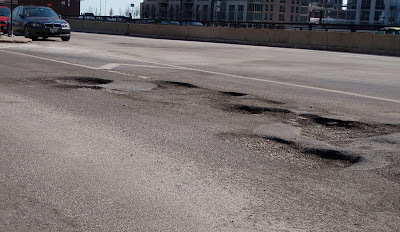 Back in early February, there were about 4,500 still-unfilled potholes in the city's Pothole Information System. But that was before the February Thaw and February Freeze that probably created a "hole" lot more.